It’s no secret that I love a road trip and when we’re not travelling abroad I like to make the most of exploring a bit closer to home. Even though I passed my driving test well over ten years ago I have only just got my very own car last month and this was just the excuse I needed to plan a mini adventure with just me and my girl. Clavertye Shepherd’s Huts was the perfect place. Set on a huge farm in the countryside near Canterbury just over an hour from home, meant that it wasn’t too far for me to travel alone with a (possibly screaming) 6 month young baby. Luckily for me Evie slept away soundly in the back of the car for the entire journey so when we arrived at the farm nice and relaxed and I spotted our tiny little hut far away in the distance at the top of the valley, I knew this was going to be a wonderful getaway. I quite literally fell in love with our hut as soon as we stepped inside. It was tiny, like really tiny, but absolutely perfect for just the two of us. A comfy double bed took up one side of the hut which very quickly became Evie’s play area and the window over the bed became her little exploration into the outside world. The other end of the hut had a small bathroom with a modern hot shower and a composting toilet. Slightly strange using a composting loo but, you’ll be glad to know, it was completely smell free and a bonus of having no flush meant Evie wasn’t disturbed from her naps! There was also a lovely view looking out over the valley whilst sitting on the toilet! The rest of the hut held the fireplace, with plenty of logs and kindling to keep us warm throughout our stay, and the cute as a button mint kitchen stocked with all the utensils and cookware we needed including dainty china cups and teapots, along with breads, cereals, tea, coffee, milk and biscuits for our breakfast. It was just so cute! Colourful bunting hung from the ceiling, a retro radio and little heart ornaments were dotted about, and lots of animal print and flowery cushions covered the bed. Mr Ayla would not have appreciated these little details so I’m glad that this break was girls only! I’d brought along some of our own food which I filled the mini fridge with. Now I’m no cook but even I managed to whip up some lovely meals for the two of us while we were here. 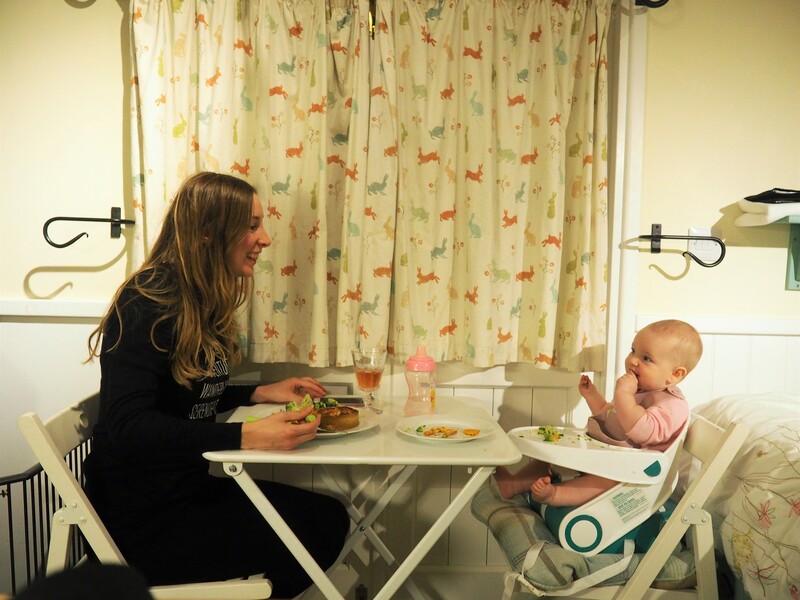 With the fold away table and chairs out, Evie on her booster seat, and literally no room left in the hut, we had some nice romantic meals for two. Hannah and Mark who live on the farm with their family and run the shepherd’s huts were so lovely and welcoming. They drove our bags up to the hut on the back of their quad bike, suggested some walking routes that were possible with a baby, and left some fresh eggs out for us that I collected from the barn to make some eggy bread for our breakfast. 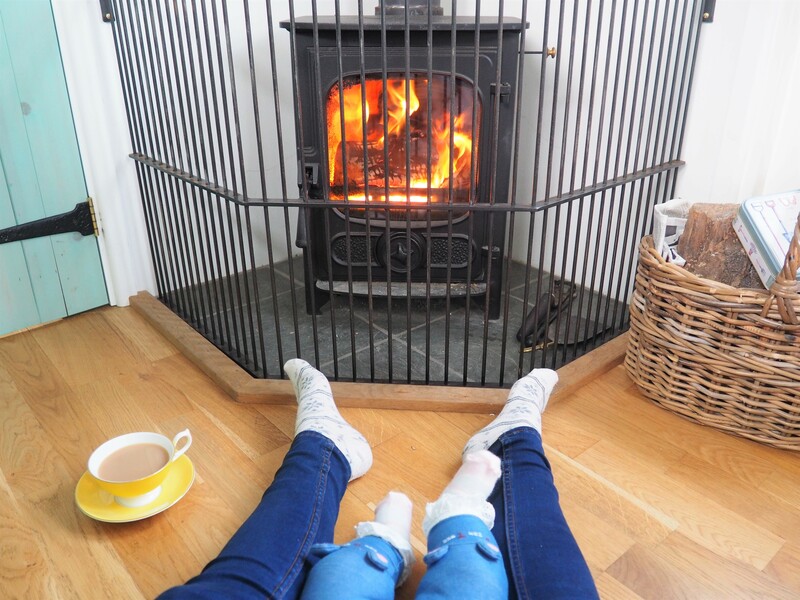 Sleeping in a wooden hut in October in England obviously meant that we were ridiculously freezing so I got the fire started each evening and again in the morning making us nice and cosy for our morning drinks – tea for me and milk for her. With the fire going in the evenings it was so toasty and snug in the hut. Once Evie had drifted off to sleep, with phone signal being rather sporadic (which was actually nice for a change as it meant a complete detox from everything), I got cosy with a cup of tea, biscuits and a book one night and the next night I went wild with some wine, cheese and crackers and a downloaded Netflix episode of Gilmore Girls. I mean seriously could this getaway get any more perfect? But then it did when we witnessed the sky lighting up bright pinks and oranges over the valley one evening with possibly the most gorgeous sunset I’ve ever seen in the UK. As much as I would have loved to stay all snug inside the hut the entire time, of course we did some exploring too. We went for some walks to meet the cows on the farm (the cows and Evie seemed to enjoy playing some sort of staring competition with each other) and we wandered through the woods bursting with colourful autumn leaves. We also went for a stroll into the nearby village where of course we ended up in the local cake shop, The Cosy Tea Rooms of Elham. Super cosy, very vintage and the yummiest cake that Evie tried pinching off me resulting in icing everywhere! Back at Clavertye, just outside our hut was a huge tree which had our own bench swing hanging from the branches. Even though it was a bit chilly, I loved putting our woolly jumpers and hats on and sitting outside and Evie enjoyed gently swinging on the bench. We could see for miles across the valley; no one else was around, the only sounds were the birds chirping and it was just glorious. So peaceful and serene. 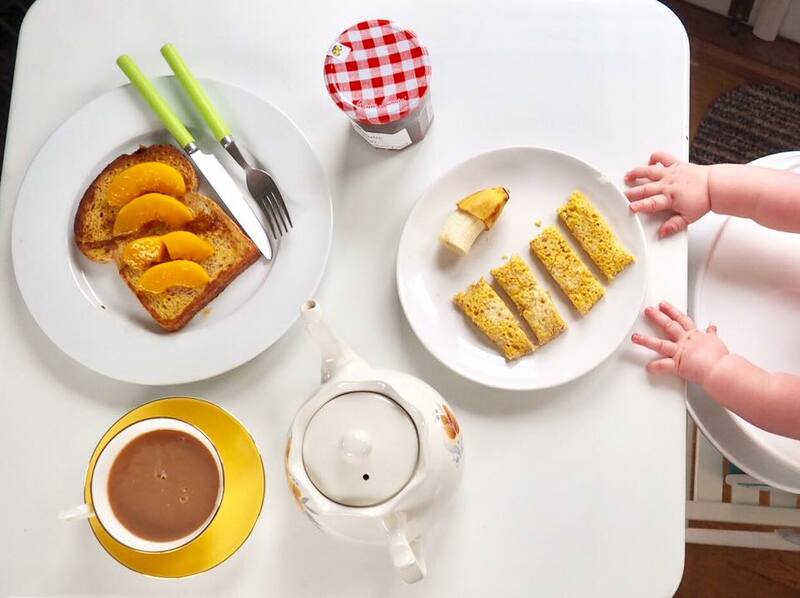 It was just the perfect place for a relaxing getaway – and relaxing isn’t a word I would usually use where Evie is concerned but it really was! This is officially the cutest place I have ever stayed. Cute beyond words. So ridiculously cute that if I had my own back garden I would have tried to take the hut home with me. I’m already looking forward to a return trip back here next year when I’m told the valley is full of colourful bluebells. Evie should be waddling about by then and if she’s as inquisitive as she is now I am going to love watching her exploring through the fields full of flowers. 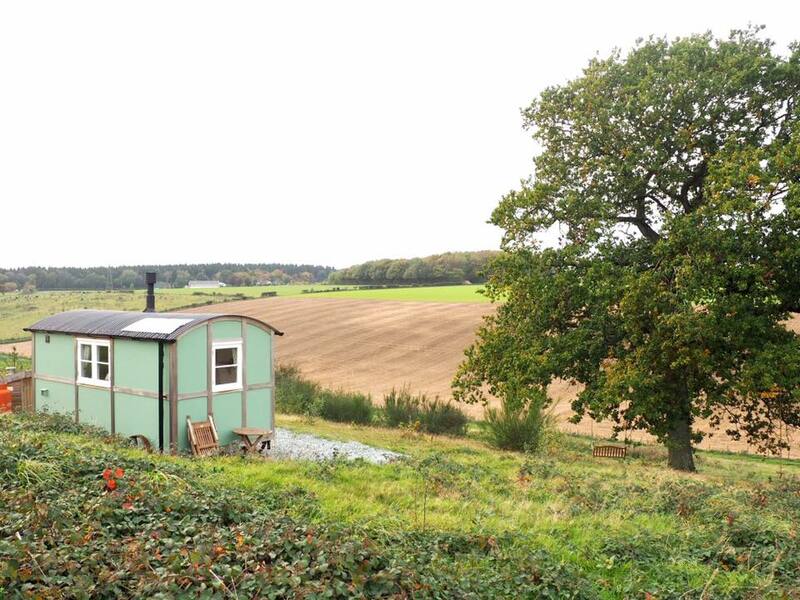 Thank you to Clavertye Shepherd’s Huts who hosted our stay and gave us the best girly break. We will definitely be back next year! This little cottage looks absolutely divine and I adore the furnishings and the fireplace! What a perfect location to explore and also to relax. Your sunset photograph has to be one of the most special I have seen. Thank you for sharing your girls’ road trip with us! Thanks hun! It really was such a gorgeous little place and all the furnishings were just adorable. The sunset was magical. I’ve never seen one that colourful in the UK! Yes totally! Would be perfect for a little romantic break too! well looks like you and bub had a wonderful time! We really did thanks Andy! Wow! You know watching a kid growing day-by-day is the most amazing thing in this whole World. You have shared really very amazing post and you are doing very well. Keep going. I really like it! keep up the great work! well done! Just cute and adorable: you girls and the hut! Thanks for posting, I’m off to check them out!